Shipping prices displayed are for a commercial address within city limits with a dock or forklift. Freight companies reserve the ability to add surcharges if the destination does not follow this definition, even if you may be accustomed to receiving LTL (less than truckload) shipments. Customers sometimes make arrangements at a local farm supply, NAPA dealer or local business to receive freight orders. Another alternative is to pick it up at the freight depot. – Click product title or photo for more detail. Flameless, sparkless diesel oil rig heaters are the safest heat available for volatile situations. No OSHA type setbacks are required as there are no open flames nor sparks. No generator or other electrical power is necessary. A diesel engine is enclosed in an insulated chamber. Engine torque is converted to heat and combined with the heat of the engine. All heaters are equipped with a set of four shut-off switches that terminate the engine when inadequate or excessive pressures, speed or water temperatures are detected. Totally self contained, these patent-protected oil rig heaters are also popular for other applications requiring heated air and high air flows. These units are also applicable for fire restoration, thermal remediation, pest control and any application where self-powered heat is needed. Technically not a “trailer”, they are equippped with lights for safe highway towability. Therm Dynamics has added new refinements to a proven concept. Higher precision in manufacturing and design improvements have increased the BTU output as well as dramatically increased the amount of air delivered. The addition of an additional “pusher” fan, now standard equipment on all models, greatly increases static pressure, allowing longer duct lengths, higher CFMs and more heat. New model numbers are similar to previous years but with slight variances denoting the changes. Economical new smaller models are being offered with Kubota engines in addition to the standard Caterpillar powered heaters. Equipmentland is the primary source for information and customization to meet your needs and is the leading provider of heaters for new markets and export. This flameless heat generating unit for oil rigs and other demanding applications is a highly efficient and extremely safe alternative for the production of large volumes of heat. Therm Dynamics has developed the patented process of converting and capturing the torque of a diesel engine into heat, and combining it with all the other sources of heat – from the heads, exhaust, cooling system – to make a totally flameless and sparkless heater that provides its own high volume airflow without any electric fans or any other ignition sources, making this the safest heater by far for volatile environments. The flameless heater complies with OSHA regulations on oil fields and other applications. 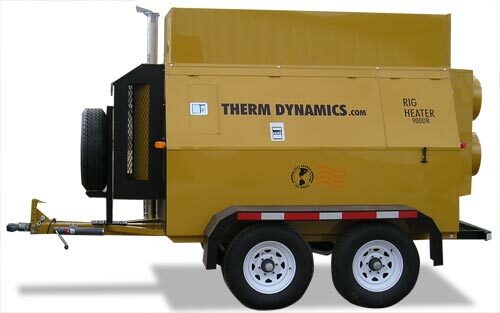 Therm Dynamic’s patented technology uses diesel power to agitate hydraulic oil in a flameless, sparkless, low-pressure environment to deliver high BTU output and remarkable air flow up to 9,000 CFM. In brief, the Therm Dynamics system converts the engine torque into heat and dissipates it inside an insulated cabinet which also captures the heat produced by the engine heads, cooling system and exhaust. The unit is a Caterpillar-powered specialized heat producing unit which is safer and more trouble free than anything else on the market. The engine’s torque heats hydraulic oil in a closed system which the unit extracts the heat and utilizes all the other heat generation aspects of the engine, providing a clean pollution free discharge to the target environment. A direct drive from the diesel engine powers both the patented unit and the integrated fan to provided a robust flow of heated air. Heat output is controlled by simple RPM settings on the diesel engine throttle. Fuel economy can be achieved by simply throttling down the RPMs. All controls and auto shutdown systems are provided ensuring safe operation and equipment protection. Safety setback requirements have lessened from typical 70 – 100 ft. to zero for volatile applications. Heater fluid is heated by disc agitation and transported to the unit heat exchanger where heat transfer occurs. Clean heated air can be delivered directly from the unit’s discharge or through attachable flex ducting. A new additional fan provides static pressure higher than ever before. The heat generator and engine are enclosed in a locked cabinet complete with automatic shutdown features, floor, and removable doors. Trailer units are mounted on 5300 lb. torsion-bar axle/s with 15″ wheels and tires. Skid models are also available. Due to the few moving parts, the potential for failure is minimal. These rig heaters are designed for stand alone, 24-hour trouble free operation. Given the flameless and sparkless nature of the technology, the unit is ideal for oil wellheads, fuel farms, mines, airports and anywhere fire is of concern. Equipmentland is the original and primary online provider of flameless heaters by Therm Dynamics. Equipmentland has been instrumental in the development of the largest output models for Therm Dynamics. Contact Equipmentland today for purchasing standard equipment flameless heaters, or let us know if you need a custom unit designed. Equipmentland is the leading exporter of flameless heaters, and is accustomed to arranging deliveries outside the USA. Shipping Price: Please contact us by phone or click Get Quote for shipping.